Tired of ten-second soundbites and news you can’t use from sources you don’t trust? Concerned that the American media is turning into a national entertainment state controlled by a handful of media moguls and global corporations? We the Media offers you help and hope. Filled with up-to-the-minute facts, figures, and commentary, the book features over 100 of the leading journalists, media critics, and experts in the country on: who owns and controls the media; how the rapidly expanding empires of Disney, Time Warner, Rupert Murdoch’s NewsCorp, and other media conglomerates affect what you see, hear, and read; how political considerations and the radical right influence what gets on the air and who gets left out of the picture; and how advertising pervades virtually every second of your life. We the Media also highlights the alternatives—organizations, leaders, and the media makers who are successfully fighting the conglomerates and demanding that media and democracy go together. Our media system has been transformed and our lives will be changed in ways we don't even know yet. But we can do something about it. We the Media is a survival guide to navigating the brave new media landscape. Don Hazen, former publisher of Mother Jones, is executive director of the Independent Media Institute and executive editor of AlterNet. Julie Winokur is a freelance writer and editor. 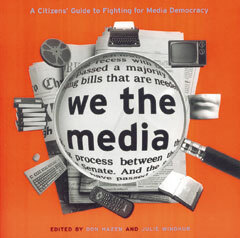 She is a co-editor, with Don Hazen, of We the Media: A Citizens’ Guide to Fighting for Media Democracy (The New Press).